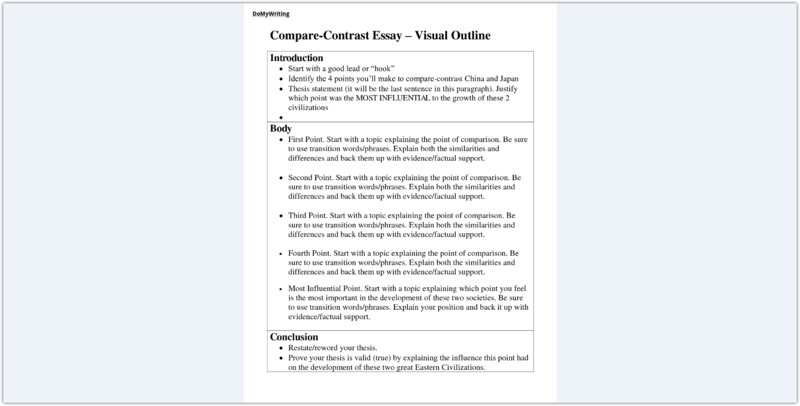 Compare and contrast essay is one of the popular forms of written academic tasks. It can be a separate assignment or a part of a bigger one where you need to make comparison of several objects of facts. Before you begin writing choose a topic you will focus on. There are lots of subjects that have common and different features. It is advisable choosing something you really understand about and feel free to express your opinion. It is easy to understand the essence of the task from its name. Comparison means to say what is similar between the analyzed objects or facts. And contrasting means to say what is different between these objects of facts. To make it short, you should include common and different features of the objects into your text. When assigning this paper, teachers want you to analyze what is similar and different in given theories, characters in the literature, periods in history, etc. you will be learning how to differentiate between such objects and see their common traits. Make sure you only use reliable sources. It should be mentioned that this type of essay is a little bit more complicated than other types of written tasks, so you will need to put more time and effort to compose an impassive paper. If you decide to make subject-by-subject comparison, you should concentrate on describing issue No. 1 including its aspects and nuances, and then proceed to Issue No. 2. Put the common and different features of the issues in the final part. Normally, introduction would contain the general idea of the further analyzes and the basic information about the analyzed objects/facts. In this part you should also explain why you chose these objects for analyzes and how your research will be useful for your audience. Keep in mind to include an impressive hook that will glue readers to your essay till the last word in it. Depending on the analyzed objects, he hook can be different – from a good joke to quotations and stories. Organizational instruments will help you keep the information and ideas you produce during research in order. Make your thesis statement clear and precise. Always remember to edit and proofread your essay before handling it to your teacher. You can ask a friend or a group mate to do that. Or you can trust such important task to professional writers of domywriting.com service. 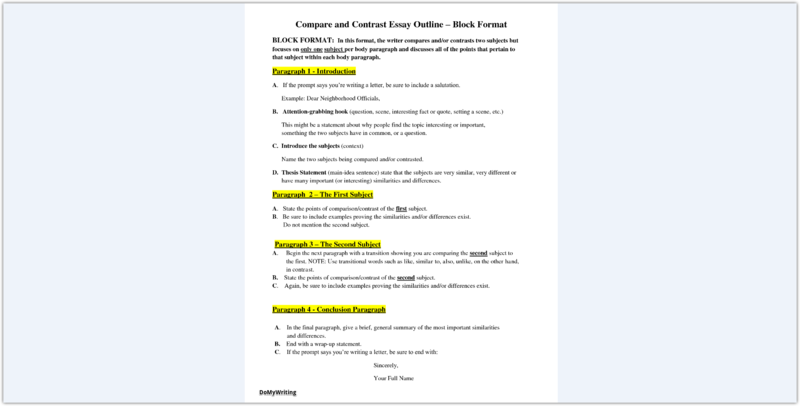 You should not eliminate the importance of the last part of your compare and contrast essay. This is the text the audience will read last and remember it most of all. It means the conclusions should be no less impressive than the introductory part. 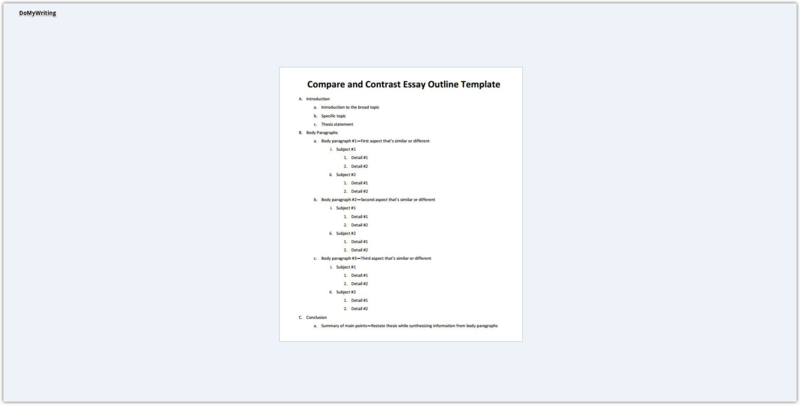 Here you need to provide a short summary of what was written above, reward and present your thesis statement. Keep in mind that the statement in the conclusion should be altered a little bit from the one you have in introduction. With the help of such words you make designate where the objects are compared, and where contrasted. To be different from, etc. To help you chose the topic for your essay we have prepared the following winning themes you may use for your paper or get inspired by them to create your own. What are the characteristic features that make Renaissance and Baroque so look alike yet different? Should US government learn something from School Government or vice versa? Fiction vs. Non-fiction: what would you prefer reading? Superman versus Spider-man: who is stronger? What did you like playing most of all – Super Mario or Sonic? Real or online games: where do you benefit more? Physics versus Chemistry: which subject is more useful? Which natural catastrophe causes worse consequences: tsunami or earthquake? Should you stick to public opinion or form your personal? Which character do you prefer- Dumbledore or Gandalf? Where do you prefer watching movies – cinema or your home screen? Domywriting.com is the team of expert writers in different spheres of life. We know all the aspects of a winning essay. Our experience in writing, individual approach to every order allows us producing excellent papers. 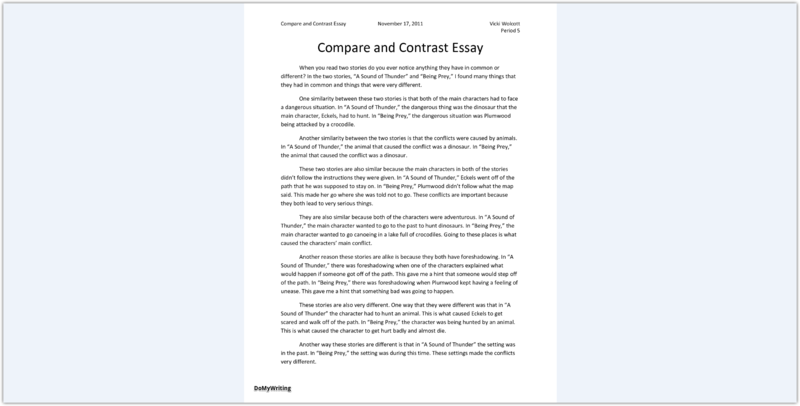 Your custom compare and contrast essay will have the necessary structure and contain good evidences to prove your point of view. We help selecting the topic that is going to be successful among your target audience and cause lots of discussions. We write written assignments of different complexity because there is nothing impossible for us.